Njegoševo (Serbian Cyrillic: Његошево) is a village in Serbia. It is situated in the Bačka Topola municipality, in the North Bačka District, Vojvodina province. The village has a Serb ethnic majority and its population numbering 632 people (2002 census). In Serbian the village is known as Njegoševo (Његошево), in Hungarian as Istenáldás, and in Croatian as Njegoševo. Slobodan Ćurčić, Broj stanovnika Vojvodine, Novi Sad, 1996. 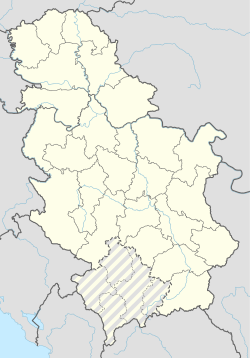 This North Bačka District, Vojvodina location article is a stub. You can help Wikipedia by expanding it. This page was last edited on 28 February 2019, at 04:09 (UTC).